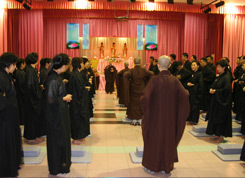 Than Hsiang Temple will hold a Seven Day Amitabha Recitation Retreat (Fo Qi) in November of each year. Devotees participating in this Retreat have to observe the Eight Precepts and the daily programme is similar to that of the Eight Precepts Cultivation (see below). The only difference is that the Retreat is for a duration of seven full days of Eight Precepts cultivation and Amitabha Buddha name recitation. As the name implies, all participants have to stay in Than Hsiang Temple for the duration of the Retreat. 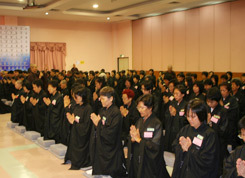 Devotees aged from 16 to 60 are welcomed to participate in the Retreat. 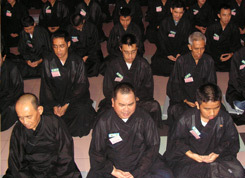 Those having good attitude, willing to learn Buddhism are encouraged to participate with the determination to concentrate single-mindedly on the rote recitation of Amitabha Buddha Name (Yi Xin Bu Luan). 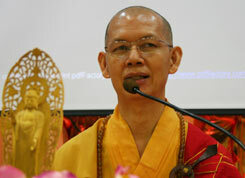 This approach was regarded as an important method of meditation by the T'ien T'ai Patriarch Chih I. It was also taught by other masters such as the renowned sixteenth century Zen Master Han-shan Te-ch'ing and the 13 th Pure Land Patriarch, Elder Master Yin Kuang . In this method, the ever-wandering mind is not only focused on many wholesome activities (bowing, reciting, circumambulation, etc. ), it also has a single transcendental focus: Amitabha Buddha. A concentrated mind, free of greed, anger and delusion, is a pure mind . 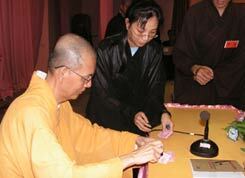 Moreover, Pure Land draws upon Amitabha Buddha's Vow to rescue all sentient beings. Reciting His name tunes the practitioner in to that Vow, to that compassion.